During a storm an elk's primary senses, it's way of detecting danger, is diminished because the wind makes everything move making the movement of predators hard to spot, the sound of approaching danger is covered, and their best defense, their sense of smell, is destroyed because the wind is usually swirling so much it's impossible to tell which direction it's coming from. 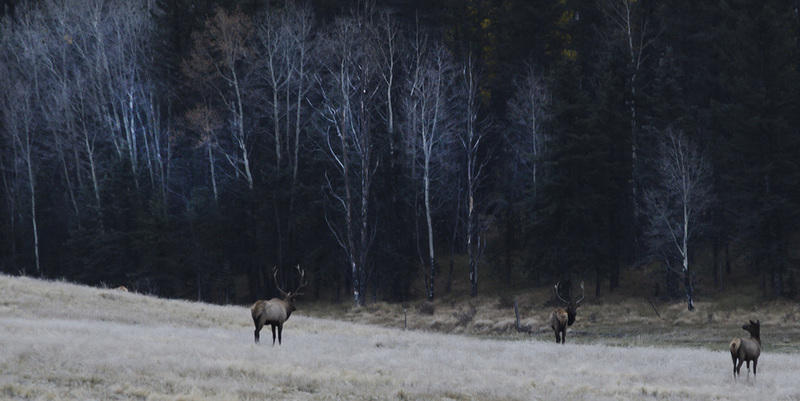 In the worst of storms elk will often be found together out in the open in a circle facing outward making the approach of predators impossible. Here a herd is getting ready to move. Being out in the open like this makes it impossible for any archery hunter to get close enough for a shot. All those eyes watching making it extremely difficult to remain undetected. A rifle hunter will also find it hard to make a clean kill with them all bunched together as well. A pretty nifty defense if you ask me.